It was sometime in 2000, in some place like New York, Los Angeles or Boston, when I thought I would be seeing Janet Evans for the last time. 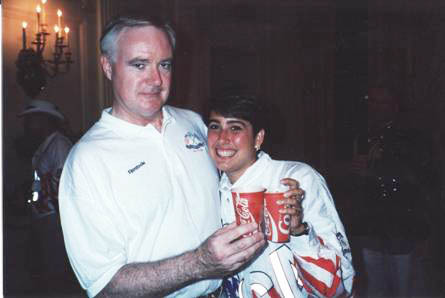 Over a dozen years and three Olympics, I had become accustomed to seeing the Olympic Hall of Fame swimming star on a regular basis, and I hated the idea that she and I would not get another chance to say hello and make small talk, pose for a picture, and recall the huge moments in her career. She was making another appearance, as she had done countless times, at a Xerox-sponsored fund-raising event for the United States Olympic Committee, like Olympians Bob Beamon, Donna de Varona, Jeff Blatnick, Al Oerter, Bonnie Blair, Bart Conner, Teresa Edwards, Mike Eruzione, Billy Mills, John Naber, and Bill Toomey did all the time. I had introduced them all, in cities here and there, and watched as audiences reacted with delight in seeing these legends and hearing their stories. Evans got the attention of the world in 1988 as a 17-year-old swimming sensation in Seoul. The California teenager, with her quirky windmill stroke, won three gold medals at Olympic Park, set a world record and an Olympic record, and whipped the shadowy East German stars Heike Friedrich, Anke Mohring and Astrid Straub, at the time the ultimate Good versus Evil story line. By the time Barcelona rolled around in 1992, she had become the world’s greatest female distance swimmer, with two more golds in steamy Perth at the 1991 World Championships. She did not disappoint in Spain, capturing a gold and silver. But when the world came to Atlanta in 1996 for the Centennial Olympic Games, it was a different story for Evans. I still have a trio of memories of her during the Atlanta Games. Sitting with NBC’s Tom Brokaw and his wife at the Opening Ceremony, we both had a “wow” moment when she handed the Olympic Torch to Muhammad Ali and a stunned worldwide audience watched the boxing legend haltingly light the cauldron. On July 26, she climbed out of the pool after finishing sixth in the 800 meter event behind a new teenage star, 16-year-old Brooke Bennett. It was supposed to be her final Olympic race and some described it as passing the torch to Bennett. But it really wasn’t. The next evening, television audiences watched in horror as she was being interviewed by a television crew at Olympic Park when an explosion rocked the venue, killing one and injuring 111 others. That was supposed to be the final drama, retirement, and she walked through the portal of time that all Olympians do, and on to life. It was full speed ahead to a new career as an in demand motivational speaker, author, spokesperson, businesswoman and mother. She’s now the mom to kids Sydney (5) and Jake (2). But something was missing, and she apparently has found it. Last weekend in Austin, the 40-year-old Evans was rewarded for a year’s work of pain, 4:30 a.m. wakeup calls, and hundreds of hours in assorted pools with the chlorine and caps, with Olympic Trials qualifying times in the 400 and 800 meter freestyle events. Though 24 years have passed since she set the world record in the 800, the standard remains, and no woman has eclipsed her time. So in June in Omaha, Evans will likely get her husband and kids set in their seats at the Century Link Center, head to the dressing room to pull on her suit again, and face women half her age, some who won’t even really understand who she is, and begin what some may say is a quixotic journey that could land her in London in July at the 2012 Olympic Games. Ask Dara Torres about that. The athletes of the Olympic family always seem to produce this kind of story, stories that lift people from the grind of their lives and the suffocating reality of trouble, illness and struggle. Billy Mills down the stretch in Tokyo 1964, Eruzione’s goal against the Soviets in 1980, Blair’s five golds in speed skating in Calgary, Albertville and Lillehammer, de Varona’s teenage success in Tokyo’s Olympic pool in 1964, Beamon’s historic leap in Mexico City, Toomey’s decathlon in 1968, Blatnick’s moment on the mat in 1984, and Oerter’s four straight discus triumphs. There was a time when it was common to say that great athletes, actors, politicians and artists should get out when the time is right. See Sandy Koufax, Bill Russell, Carl Lewis, Edwin Moses, Rocky Marciano, Jim Brown and Ted Williams. Others, like Warren Spahn, Willie Mays, Sugar Ray Leonard, Pele, Steve Carlton, Gordie Howe and even Johnny Unitas stayed too long after their brilliance had dimmed. One day in October, 1990, 40-year-old Mark Spitz, he of the seven gold medals in Munich two decades earlier, came to the Olympic Training Center in Colorado Springs to begin an attempt to make the 1992 Olympic Team. The greatest male swimmer of our time, like Evans, had hung up his suit to become a motivational speaker and celebrity, but he wanted another shot, touched again by the heat of the Olympic flame. His dream died in time when he could not match the times of the teens and twenty somethings that he would compete against for a trip to Barcelona. Not so now for Evans, and Torres, women who have become successes away from the pool – moms and authors, speakers and inspirations to girls and women across the landscape of America. I don’t pretend to know why Janet Evans has decided to chase an Olympic dream again, maybe she really has no easy answer. But whatever it may be, who among us can’t fall in love with it and want her to succeed?